Before you face the prospect of creating your own RSS news feeds, it's important to explore existing news feeds and learn how they work. The easiest way to do this is by installing news aggregator software and exploring feeds for yourself. One of the most popular news aggregators available now is FeedDemon, which is available in a free trial version online at http://www.feeddemon.com/. FeedDemon is a standalone desktop application that is completely independent of your web browser. 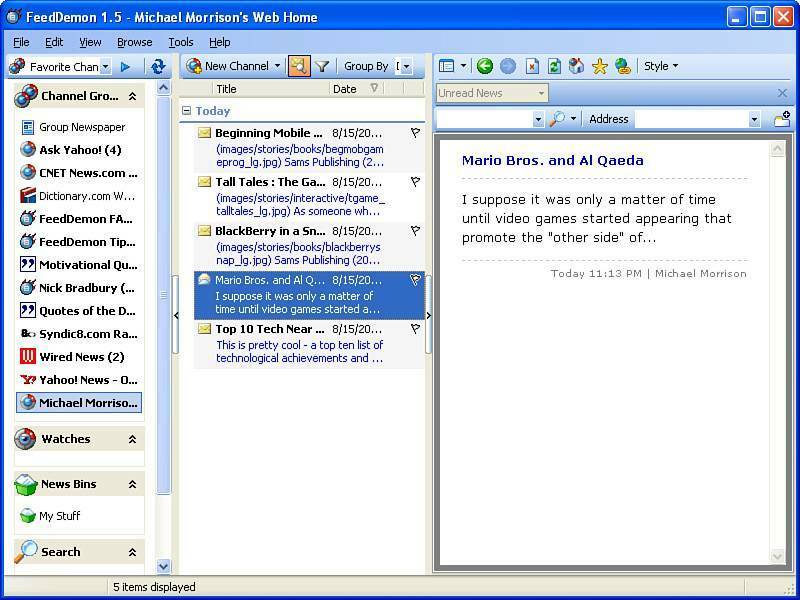 If you want a more integrated RSS experience, you may want to look into an aggregator that ties into Microsoft Outlook, such as NewsGator (http://www.newsgator.com/). 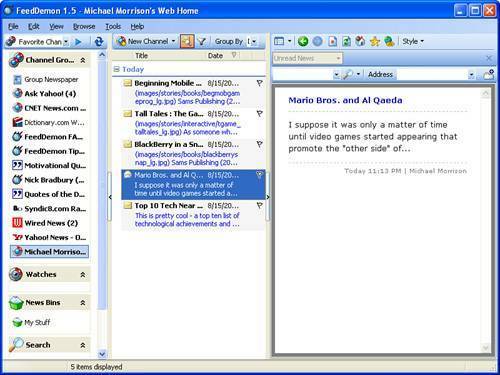 NewsGator is an Outlook plug-in that integrates news feeds into Outlook by establishing a News folder under the normal Personal Folders commonly used in Outlook. 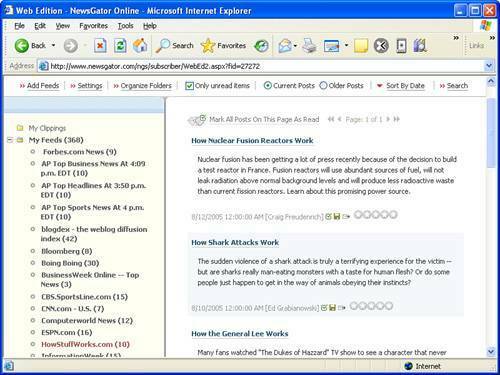 NewsGator also offers a free web-based version of its news aggregator called NewsGator Online. This is a great way to gain an introduction to news feeds because it is free and easy to use. Interestingly enough, NewsGator recently purchased Bradbury Software, the maker of FeedDemon, so don't be surprised if FeedDemon is eventually marketed as a desktop edition of NewsGator. Just in case you think I'm being a bit partial to NewsGator, some other popular online news aggregators include Bloglines (http://www.bloglines.com/), NewsIsFree (http://www.newsisfree.com/), and Microsoft's experimental start.com (http://www.start.com/). Google News (http://www.newsisfree.com/) can even be considered an aggregator of sorts, although it doesn't provide as much flexibility as a true RSS feed manager. Google News is perhaps more powerful as a feed generator because you can use it to easily syndicate Google News categories and even Google searches. One other option in regard to accessing news feeds is a browser-based feed reader such as Apple's Safari RSS browser. Safari incorporates RSS into its core, effectively making site syndication a standard component of the browser experience. Apparently other browser vendors are taking note as Microsoft has already announced RSS support in its next version of Internet Explorer. You can also install RSS plug-ins for existing browsers, such as the Sage RSS aggregator for Mozilla Firefox (http://sage.mozdev.org/). Just so you have a good picture in your mind of how news aggregators work, let's take a quick look at a couple of examples of how to access syndicated RSS feeds. 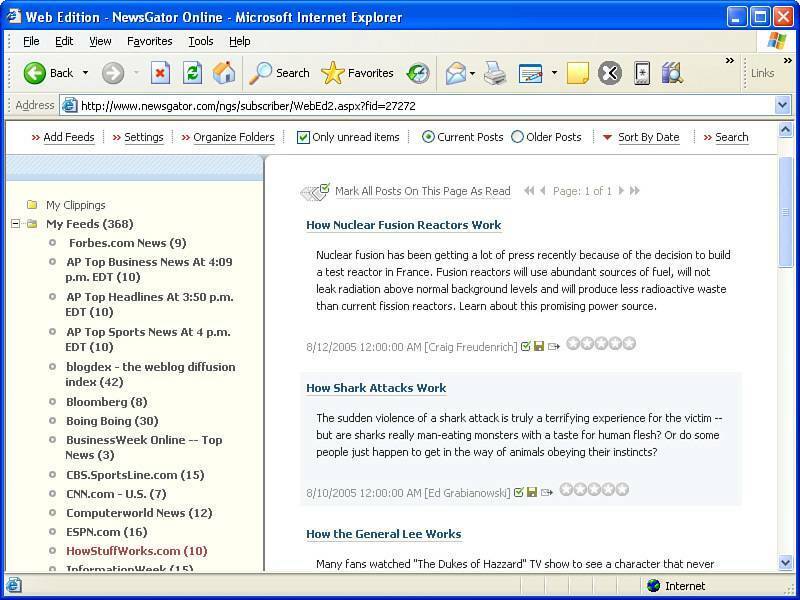 Figure 24.1 shows the NewsGator Online web-based news aggregator in action. Figure 24.1. NewsGator Online serves as a decent news aggregator without you having to purchase or download anything. In the figure, NewsGator Online is being used to view the HowStuffWorks.com RSS feed. This feed is regularly updated with links to articles about how things work. For example, in the figure there are articles listed ranging from how nuclear fusion reactors work to how shark attacks work to how the General Lee car (from The Dukes of Hazzard television show and movie) works. If you want a more full-featured news aggregator that gives you much more control over news feeds, you may want to consider using a desktop or plug-in aggregator. Figure 24.2 shows the FeedDemon desktop aggregator as I'm viewing some very familiar content. Figure 24.2. FeedDemon is one of the leading desktop news aggregators, and is reasonably priced. FeedDemon makes it possible to easily manage quite a few feeds without feeling as if you're totally overburdened with information. After you get comfortable using a news aggregator such as FeedDemon, you'll quickly realize how much more efficiently you can access and process web content. I rarely find myself hopping from site to site now that I can conveniently keep tabs on favorites via news feeds.